Discover How we Got Well After Our Indoor Air Poisoned Us & Take Simple Steps Toward Total Recovery With This Easy-to-Follow Guide. Test, Eliminate, Detox. Could indoor air quality be making you sick? Looking to improve your overall health, naturally? Learn how to test for toxins that could be making you sick. If you could improve your air and feel better, would you do it? This guide contains all of the info you need to determine if your lack of indoor air quaility is literally killing you and what you can do about it. If what helped me, could help you, wouldn’t you want to know about it? Give me a chance to help you. 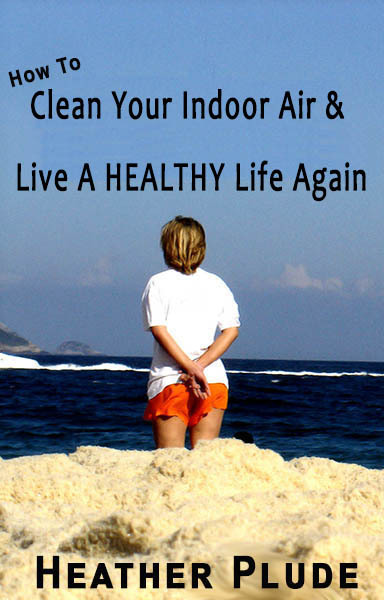 No one should have to be sick from poor indoor air quality. Millions are sick. Many people get well. The book that saved our lives: Surviving Mold is available on Kindle or paperback. Our whole family was sick in one way or another. This book put the pieces together and showed me that it was possible that our house was making us sick. Microbes, especially molds and bacteria, growing in water-damaged buildings do make people very, very sick. It’s much more than just allergies and asthma! If you have an ill-defined chronic illness, or know someone who does, your first step to return to health might be to ask if there is the possibility of exposure to musty basements, wet bathrooms, leaking roofs, flat-roofed schools, offices buildings with recirculated air or buildings with construction defects. If you already know that you could be sickened by water-damaged buildings, Surviving Mold will guide you through diagnosis and treatment, through remediation and return to health. Complete with multiple chapters written by guest authors, Surviving Mold is based on Dr. Shoemaker’s experience with over 6000 patients he has treated from all 50 states and 30 foreign countries. The science in Surviving Mold is all peer-reviewed and published. Clean is an doctor’s program designed to be easily incorporated into our busy schedule while providing all the practical tools necessary to support and rejuvenate our bodies. The effect is transformative: nagging health problems will suddenly disappear, extra weight will drop away, and for the first time in our lives, we will experience what it truly means to feel healthy. I used this program for 13 weeks when I first got out of the mold and I found it to be very helpful for my struggling body to only consume Clean food. Plus, learning what is really in food and why some foods are very bad for us was life-changing. For homeowners, renters, and employees, who are or could become sick from mold or chemical exposures from floods, hurricanes, sick buildings, and the ever present environmental pollution that affects us all. 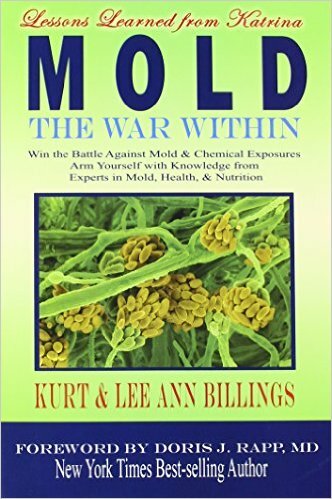 Authors Kurt and Lee Ann Billings began researching mold and chemical exposures after their family became gravely ill from toxic Katrina exposures. The Billings expose the prevalence of fungal misdiagnoses and medical mistreatments while chronicling their family’s frustrating, but ultimately successful, quest for effective treatment of mold and chemical exposures from Hurricane Katrina. They detail their months of research and trials and errors and share their inspirational journey of healing, what worked medically and nutritionally for them what didn’t and why. Read the first few chapters on Amazon for free! This book will change the way you think about food and sleep. It is at times strangely hilarious (if you actually imagine visually the unused food rotting inside while you sleep, for example), but entertaining while it covertly helps you to have healthier habits. 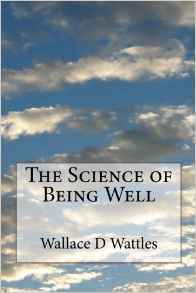 It is a great read for anyone who wants health, vitality, and long life. It uses colorful, unique descriptions of how the body restores itself. 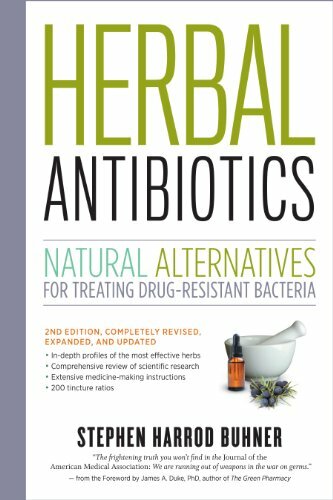 Stephen Harrod Buhner explains the roots of antibiotic resistance, explores the value of herbal treatments, and provides in-depth profiles of 30 valuable herbs, noting for each one its antibiotic properties, methods for collection and preparation, dosages, potential side effects, contraindications, and alternatives. As we prepare for the end of antibiotics, this comprehensive guide is a must-have in every family’s medicine cabinet. Lyme disease infects a minimum of 300,000 people per year in the United States and millions more throughout the rest of the world. Symptoms run from mild lethargy to severe arthritis to heart disease to incapacitating mental dysfunction. Although tests have improved over the past decade, they are still not completely reliable, and antibiotics are only partially effective. Up to thirty-five percent of those infected will not respond to antibiotic treatment or will relapse. The spirochetes that cause Lyme are stealth pathogens―they can hide within cells or alter their form so that our immune systems cannot find them, as well as inhibit the effectiveness of antibiotics. Lyme disease is, in fact, a potent emerging epidemic disease for which technological medicine is only partially effective. The coinfections that accompany Lyme are often as, or more, incapacitating than Lyme itself. Worldwide, hundreds of millions experience infection with babesia, bartonella, ehrlichia, anaplasma, mycoplasma, chlamydia, and the spotted fever rickettsiosis. 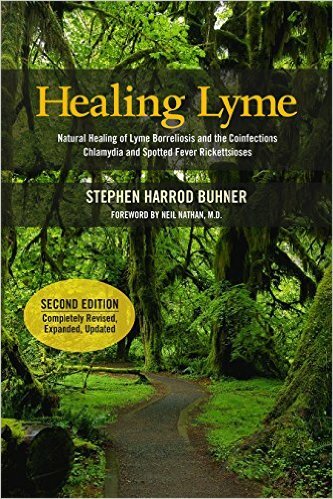 Healing Lyme examines the leading, scientific research on Lyme infection and its tests and treatments, and outlines the most potent natural medicines that offer help, either alone or in combination with antibiotics, for preventing and healing the disease. The book has been a bestseller for over a decade, and during that time the author has had contact with over 25,000 people who have used some form of these protocols during their healing journey. This edition has been significantly updated, fully revised, and expanded to reflect the increased understandings from that extensive contact, including depth-treatment experiences with hundreds during the past decade. Healing Lyme is the primary text in print on what Lyme bacteria do in the body and how natural approaches can heal the disease. It is the first book in print covering depth understanding and treatment of chlamydial and rickettsial coinfections. Ten years ago, investigative reporter Arnold Mann blew the lid off Toxic Mold with a series of cover stories and features in Time and USA Weekend magazines. Now he’s back with an eye on the big picture. *The hundreds of thousands of veterans whose lives have been destroyed by Gulf War Syndrome in the biggest military cover-up in American history. *The CDC burying its own researchers’ data and turning a blind eye to infants dying in mold-infested inner city housing. *Thousands of Gulf of Mexico cleanup workers denied critical protective equipment, for appearance purposes, while key government agencies look on with indifference. *Wealthy homeowners poisoned in their own toxic mansions. Mann has painstakingly documented their heart-breaking personal stories, along with medical testimony from renowned physicians and researchers who specialize in this new field of medicine. 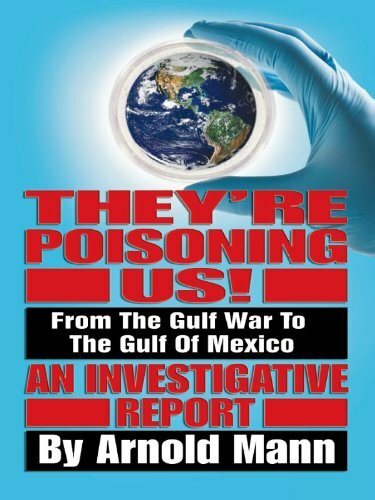 In They’re Poisoning Us, Mann tells a riveting story of concealment, confusion and insidiously immoral behavior on the part of industry and governmental agencies. He also reveals exciting new scientific developments that are finally producing new treatments for the chemically disabled. This book is a must-read for anyone concerned about their health and the health of their loved ones in our increasingly chemicalized world. “This book truthfully is the only book I have ever begun to read and couldn’t put down until I was finished. The quality of writing and subject matter – it’s a Masterpiece!” – David Lewis, Ph.D., former senior EPA Research Microbiologist. “Arnold Mann’s reporting on environmental toxins and resulting illnesses has enabled patients and doctors to look beyond the obvious for answers to mysterious symptoms. His earlier reporting saved lives; this book will save countless more.” – Melinda Ballard, Policyholders of America. “This is a compelling book – a real page-turner. It covers the lack of research, the lack of government support, physician ignorance and/or duplicity, and industry’s indifference and outright lies to the victims of toxic exposures” – Cynthia Wilson, Executive Director, Chemical Injury Information Network. Do You have a favorite book? Tell us about it! We love to hear from our readers! If you have a book that has helped you get your health back… leave us a comment!